Our range of products include 1.00 sq.mm. 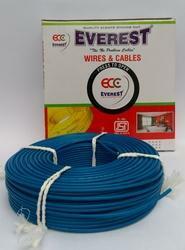 everest ( fr )pvc insulated electrical wire, pvc insulated electrical wire, 1.5 sq.mm. 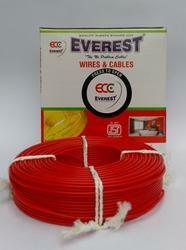 everest ( fr ) pvc insulated electrical wire, 2.5 sq.mm. 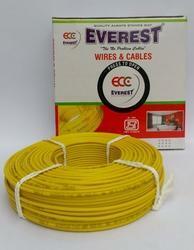 everest ( fr ) pvc insulated electrical wire, 4.0 sq.mm. 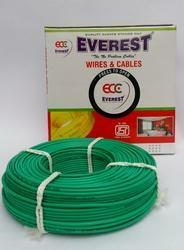 everest ( fr ) pvc insulated electrical wire and 6.0 sq.mm. 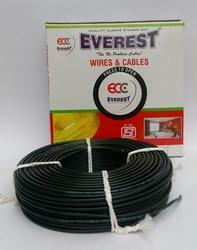 everest ( fr ) pvc insulated electrical wire. 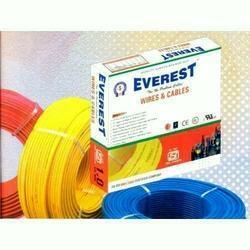 Everest house wiring cables is a trusted name today for reliable electrical wiring in homes, offices, multi storied buildings, hospitals, hotels, schools and industries, etc., enjoying an enviable reputation for its quality and reliability. EVEREST wires are manufactured from best quality, bright annealed electrolytic grade copper with conductivity of more than 99.997% for smooth flow of electricity thus saving energy consumption. PVC used as an insulant is manufactured in-house and has good dielectric and physical properties with high insulation resistance value that protects against any electrical fault. EVEREST” house wiring cables is a trusted name today for reliable electrical wiring homes, offers multistoried buildings, hospitals, hotels, schools and industries, etc. enjoying an enviable reputation for us quality and reliability. EVEREST” wires are manufactured from best quality, bright annealed electrical grade copper with conductivity of more than 99.997% for smooth flow of electricity thus saving energy consumption. PVC used as an insulant is manufactured in-house and has good dielectric and physical properties with high insulation resistance value that protects against any electrical fault. EVEREST” wires are manufactured with solid standard and multi-stranded conductor conforming to IS 694/1990 with updated amendments. The flawless quality of EVEREST” wires and cables is continuously upgraded for consistence performance and long service life. No wonder then that they are called “THE NO PROBLUC CABLES’. Fire Retardant (FR) our normal wires are fire retardant with a high oxygen and temperature index that helps in restricting spread of fire even at high temperatures. Fire Retardant Low Smoke (FRLS) Apart from a high oxygen and temperature index our FRLS wires low smoke and toxic gases generation properties that help in easy evacuation and rescue operation in case of fire and are ideal for use in places of high human density. Heat Resistant (105°C) besides being fire retardant our heat resistant (105°C) cables can withstand excess heat generated within the wire due to low voltage. 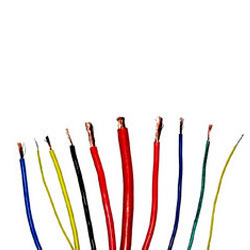 These wires can handle~ to 1Q5 ° C and are suited for areas with wide voltage fluctuations. Zero Halogen Flame Retardant ('0' HFR) Based on Poly-olefinic thermoplastic compound, our Zero Halogen Flame Retardant wires emit smoke-free. non-toxic, non-corrosive gases in case at lie retarding properties. They are ideal for use in public places where risk of human lives and property are of prime concern. Purity. Our copper has more than 99.997% conductivity which means reduction in electricity bills. Uniformity. We have the most advanced, in-house wire drawing, stranding and bunching facilities to give a uniform lay and smooth finish of the conductor. Better Flexibility. Uniform annealing of copper provides more flexibility. Double Insulated. A thin colored layer is only on the surface for colour identification. The thick layer of natural virgin PVC underneath which provides improved insulation resistance value. Centre Perfect. Automatic self-centering head coupled with on-line diameter controller maintains the conductor perfectly in the centre of PVC insulation to prevent short-circuit occurrences due to uneven thickness and eccentricity of insulation. Consistency. All wires pass through the spark tester to withstand high voltage stresses of 9000 volts for consistent quality, free of foreign particles throughout. Current Carrying Capacity. Higher current carrying capacity owing to low conductor resistance. Our clients are offered with optimal quality house wiring cables and flexible cables. These are the trusted electrical wiring for homes, offices, multi storied buildings, hospitals, hotels and industries etc. enjoying an enviable reputation for its super quality and reliability. These Cables Are Manufactured Using Best Quality Bright Annealed Electrolytic Grade Copper Having Conductivity Of More Than 102% For Smooth Flow Of Electricity Thus Saving Energy Consumption. PVC Used As An Insolent Is Manufactured In- House And Has Excellent Dielectric And Physical Properties With High Insulation Resistance Value That Protects Against Any Electrical Fault. Fire Retardant Low Smoke (Frls): Apart From A High Oxygen And Temperature Index Frls House Wiring Cables Also Have Low Smoke And Toxic Gases Generation Properties That Helps In Easy Evacuation And Rescue Operation In Case Of Fire. These Cables Are Ideal For Use In Places Of High Human Density. Zero Halogen Flame Retardant ('O' Hfr): Besides Other Fire Retarding Properties Our 'O' Hfr Wires Emit Smoke Fire, Non- Toxic, Non-Corrosive Gases In Case Of Fire. They Are Ideal For Use In Public Places Where Risk Of Human Lives And Property Are Of Prime Concern. Center Perfect: Automatic Self- Centering Head Coupled With On-Line Diameter Controller Maintains The Conductor Perfectly In The Center Of Pvc Insulation To Prevent Short Circuit Occurrences Due To Uneven Thickness And Eccentricity Of Insulation. Current Carrying Capacity: Higher Current Carrying Capacity Owing To Lessor Conductor Resistance. Flexible Cables: Everest Flexible Cable Are Also Renowned For Its Quality, Durability Reliability As Best Raw Material Inputs Are Processed On Sophisticated Extrusion Line And Strictly Tested At Every Stage. Looking for House Wiring Cables ?